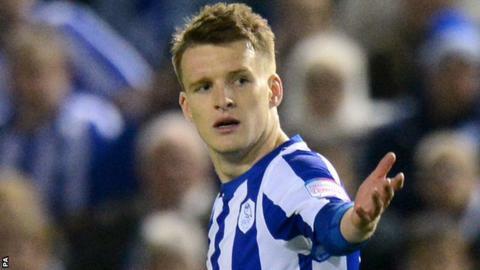 Tranmere Rovers have signed Sheffield Wednesday midfielder Paul Corry on a one-month emergency loan deal. The 22-year-old has been restricted to just eight appearances for Wednesday this term since his summer move from Irish side University College Dublin. Corry will provide cover for Rovers captain James Wallace, who is sidelined with a medial knee ligament injury. Having not featured for Rovers since 1 December, Tranmere manager Ronnie Moore now fears that former Everton trainee Wallace may not play again this season. "Wallace doesn't look too good," Moore told BBC Radio Merseyside. "We're just waiting for information on him. "We'll know a lot more on Tuesday but it's looking like he might need an operation. If he does, that will be three months. "If he is out for the rest of the season, we need to make sure we've got a replacement. "I went to watch Sheffield Wednesday in a behind-closed-doors game in midweek to look at their striker Gary Madine, but we can't afford him. "Corry was playing at the same time and played well. He took my eye and he'll give us what we've been lacking."